Sorry, no Christmas yet. Hope that’s Ok. But I’m working on some things. 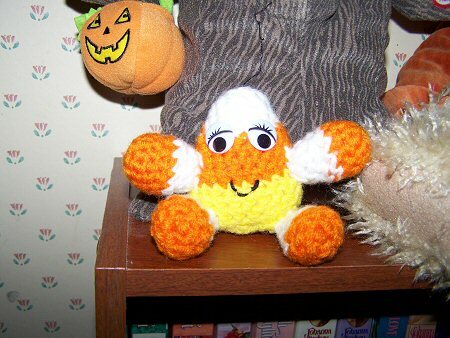 Here’s my little Candy Corn Man courtesy of a pattern I got from Stormycrochet at Etsy. I thought he was so cute so I made one of him for my kids also. Since they are fairly recent homeowners they haven’t had time to accumulate yet. I just am helping them along. I am enjoying the little amigurumis because they give some quick gratification of finishing something. I have a little monster that I’m just finishing up so I’ll get a pic posted here for you to see. Then on to Christmas. That is so cute. I love the eyes!